Between two elections, both winners and losers in the election arena do precious little to strengthen the constitutional body that places them in high pedestals. Damned if you do and damned if you don’t. The Election Commission of India is the favourite whipping boy during elections. In the last few days, the Election Commission (EC) has faced backlash over not doing enough over Uttar Pradesh CM Yogi Adityanath’s on the armed forces being “Modiji ki sena” comment, postponing the release of Vivek Oberoi film PM Narendra Modi, letting parties and politicians blatantly violate the Model Code of Conduct. The EC’s decision not to allow the biopic PM Narendra Modi to be screened during elections, a commercial venture clearly aimed at publicising PM Modi besides raking in huge profits for the producers of the film, is highly justified and in keeping with the promise to provide a level playing field to all political parties. Given the soaring popularity ratings of Modi, he hardly needs a controversial biopic to perk up his image. The BJP could have gracefully and suo moto asked for the deferment of the film till the end of elections. But even as one would expect kudos for this from the terribly rattled opposition, the Congress party has already moved the EC to protest against Union minister Maneka Gandhi’s Muslim remarks and accused the poll body of being lenient towards the ruling party. Meanwhile, Mamata Banerjee’s Trinamool Congress has accused the EC of being biased for transferring the Cooch Behar police chief two days before the constituency went to polls. Very expectedly, the mercurial Mamata has mounted a stinging attack on the EC “for taking action at the behest of the BJP”. Ironically, the West Bengal BJP too has questioned the EC’s decision to replace former DG of BSF K.K. Sharma as the observer in the state. Sharma had reportedly participated in an RSS event. The BJP has argued that the RSS is not a political party and that by attending the RSS function Sharma has committed no election-related offence. But the fact that the RSS is actively supporting the BJP is being overlooked here. These accusations and counter-allegations of the EC being biased are doing the rounds in most states with national and regional parties dutifully disagreeing with the EC for acts of commissions and omissions. 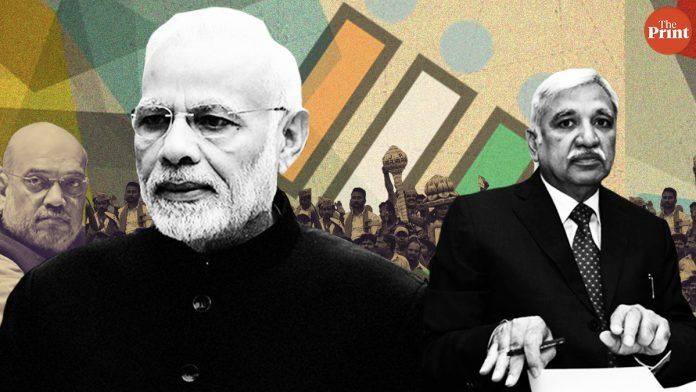 Meanwhile, during the run-up to the 2014 Lok Sabha elections, then prime ministerial candidate Narendra Modi had accused the Election Commission of being “unfair” to him because it did not grant him permission to hold a rally in Varanasi, his constituency. “With full responsibility, I’m accusing India’s Election Commission of discrimination,” he had said. The BJP was denied permission to hold an election rally by the banks of Ganga in a cramped locality. The EC reportedly denied permission on security grounds. Nevertheless, Modi and his party changed the proposed rally to a procession to the party office. Former Chief Election Commissioner V.S. Sampath dismissed the accusations and lamented that such irresponsible accusations could lead to “long term damage to the independence and neutrality” of the Election Commission. The issue died down and the spectacular victory of Modi and his party relegated all election-related acrimonies to oblivion. And here again, five years later, the allegations against the EC by all political parties sound familiar and are more or less unanimous. The Election Commission of India is responsible for conducting free and fair elections. The Lok Sabha polls span five weeks and involve 900 million voters and hundreds of regional and national political parties. The feat of successfully conducting such a mammoth election rests solely on the EC. And the EC, with hardly a few hundred permanent staff, is expected to conduct such a large jamboree with borrowed human resources. The EC has very limited time to recruit such a large staff and practically no way of screening the antecedents of the staff it is employing for several weeks. It would be not only unjust, uncharitable and unfair, but a great disservice to democracy if one were to keep accusing the EC of being biased and for the dereliction of duty. Between two elections, both the winners and losers in the election arena do precious little to strengthen the constitutional body that places them in high pedestals in states and at the Centre. The least that could be expected of the political parties is to treat the EC with as much respect and dignity, if not more, that they usually accord to the judiciary. Governments could consider enacting stricter laws making frivolous allegations against the EC during the run-up to the elections a serious offence resulting in disqualification of the candidate. It is nobody’s argument that the EC is a flawless body devoid of black sheep. Retired senior officials of the EC have been inducted into the government as ministers post-retirement by political parties thereby compromising their reputation and position as well as the impartiality of the apex election-conducting agency of the very same government whose election it facilitates. There must be a total ban on such entries into government. In democracies, it is not only necessary to be upright and honest, but also appear to be so. The adage Suspicionem Caesar supra uxorem (Caesar’s wife must be above suspicion) applies to the EC much more than it applies to the politicians. The author is the former editor of ‘Organiser’. The Model Code of Conduct has been formulated in consultation with – and with inputs from – all major parties. It should not be necessary for the ECI to repeatedly point out to senior figures that they are violating it, sometimes egregiously. We all remember Shri TN Seshan. However, the reasonable expectation is that, over time, the players themselves would respect and observe the rules.